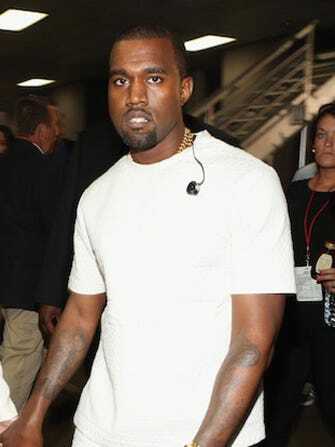 Will Kanye West Be His Own Best Man? We wouldn't expect Kanye West to do anything in a traditional manner. And, his pending nuptials to Kim Kardashian are no exception. So, when rumors began swirling about who West might choose for his best man, we were excited. Would it be his Watch the Throne collaborator Jay Z? His buddy Pharrell? Kim Kardashian's half-bro, Brody Jenner (unlikely, but anything could happen). According to the gossip site Naughty But Nice Rob, Kanye's first two choices are Robert Kardashian Sr. and Steve Jobs, his personal hero. The only problem? Both are dead. So, suggests the site, West may just have to go with his third choice — himself. "His first choice is himself," explains blogger Rob Shuter, "because he believes that he is the best man, and who can be better."